Wind turbine installation and maintenance. – Land and Sea transport logistics for wind farm installation. – Installation, commissioning and maintenance staff recruitment. – Supervision of spares supply. 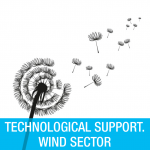 In addition, our consultants have substantial knowledge on a wide range of wind turbine models in the market, and specialise in the installation of wind turbines served Ex Works. REINOSO CONSULTORS consultants have delivered quality services across Europe, Latin America, Asia and Africa.